Your favourite music from almost every source. Radio stations from all over the world in the best quality. Room filling top-quality sound. Modern design. Also ideal for in the kitchen, living room, bedroom and study. Finally: Room filling top-quality sound, even in the bathroom. The compact premium audio system with specially developed equalizer and waterproof remote control. By sonoro, Germany. No comparison to simple bathroom radios. 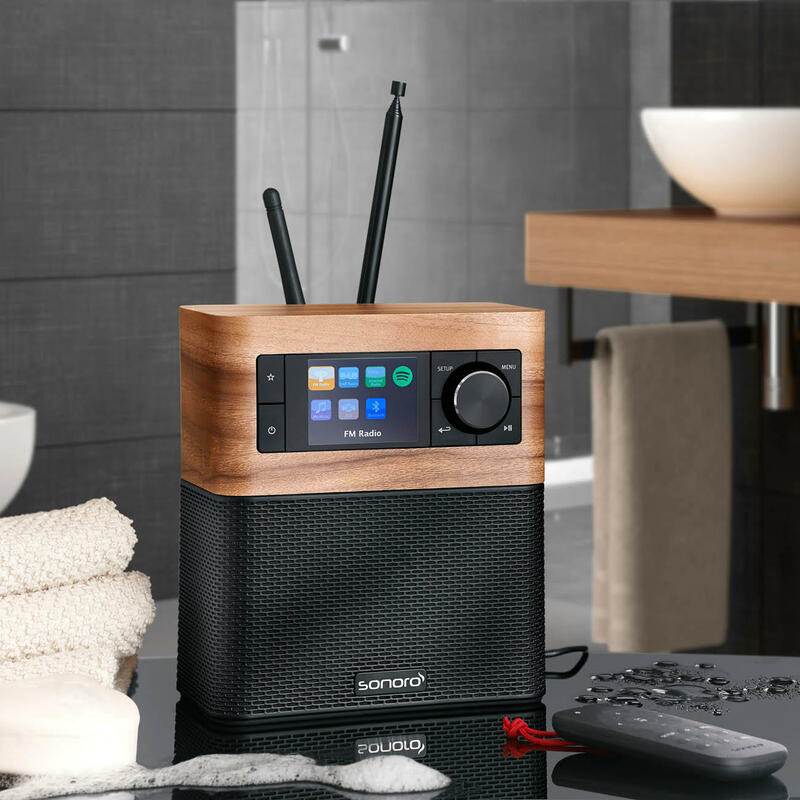 The sonoroSTREAM is a complete top-class music system – optimised for the bathroom. 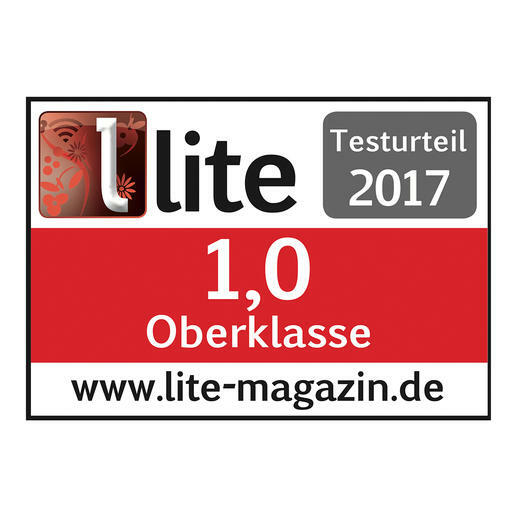 A specially developed equalizer mode (which can also be deactivated) provides excellent sound quality even in acoustically difficult rooms. The sealed housing design withstands even high humidity. With the waterproof remote control (IPX7) you can easily control song selection, volume, ... even from the shower, bath or whirlpool. 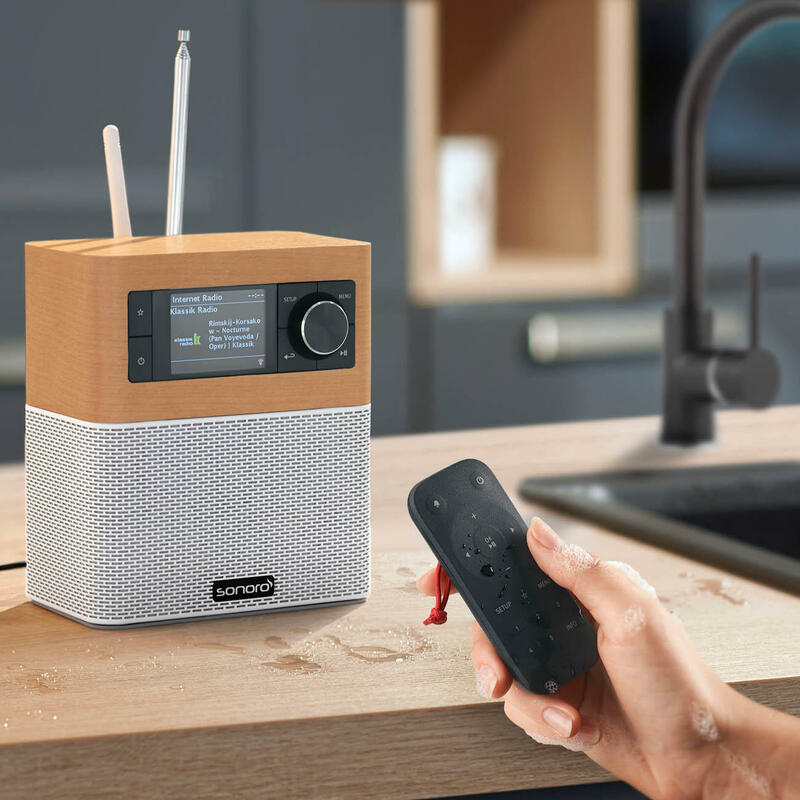 With a WLAN connection to your home network, you receive over 25,000 web radio stations from around the world or you can make use of your music collection on your computer. In addition, you can use the streaming options Spotify offers. Also integrated: An FM/digital radio receiver. Music files from smartphone/tablet are transmitted via Bluetooth (10m (32.8 ft) range). Other connectors: USB port (with charging function), 3.5mm jack for additional music sources. The high-quality wood/mesh look makes the sonoroSTREAM an eye-catcher. The 3" full range loudspeaker delivers an impressive rich and clear sound. 2 side passive drivers (bass range) perfect the sound. TFT display with automatic adjustment to ambient light. No annoying glare. If desired, it can also be controlled via smartphone/tablet (free iOS/Android app). Size (W x H x D) approx. 14.8 x 17.1 x 9cm (5.8“ x 6.7“ x 3.5“). Weight approx. 1.1kg (2.4 lbs). In 2 versions: With maple or walnut wood decor. By sonoro, Germany. Specialist in modern hi-fi electronics. Free of charge: The Pro-Idee 36-month long-term guarantee.